Orion’s new StarShoot G3 imaging camera at around $500 is a reasonably decent entry level CCD imaging system for beginners. The camera features a ½ inch format CCD as well as thermoelectric cooling (TEC) to help keep that sensor cool and noise free during those warmer months. 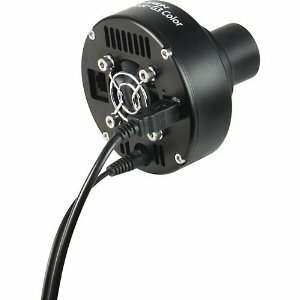 While there are several imaging systems priced well above this that exceed it in specs, this handy little unit also has an ST-4 port on it that allows it to double as an autoguider as you grow your imaging system. The unit features a 752 x 582 pixel array as well as 16 bit A/D conversion. The pixel array is 8.6 x 8.3 microns so it is capable of reproducing fine details. This unit comes with a removable 1.25” nosepiece and works as well with 2” focusers. It comes supplied with USB and 12 volt power cords. It is available in both monochrome and color models. Amateur astronomer since age 6 (1970), first 6 inch scope in 1977, 10 inch in 1985, began prime focus astrophotography in 1986. This is my favorite hobby.